NASHVILLE, Tenn. Shane Victorino bolted for Boston, Marco Scutaro stayed with San Francisco, and the Miami Marlins shed more payroll in a late-night trade. It was another busy day at baseball's winter meetings, where it's easy to tell which teams are making major changes (the Red Sox), which ones want to remain intact (the champion Giants)  and which ones are saving their cash (the Marlins, of course) and the Yankees (come again?). Boston kept spending freely, though, this time revving up the lineup Tuesday with a $39 million contract for Victorino, reports Jon Heyman of CBSSports.com. Victorino got the exact same deal as Mike Napoli did Monday from the Red Sox. Over in the National League, the well-armed Washington Nationals neared a $13 million deal with pitcher Dan Haren. "It seems like this is a market flush with money," said Yankees general manager Brian Cashman, whose big-budget club has taken a conservative approach so far. In the first two trades of the week, Colorado got effective reliever Wilton Lopez and a player to be named from Houston for young right-handers Alex White and Alex Gillingham, and Miami sent recently acquired shortstop Yunel Escobar to Tampa Bay. Cy Young Award winner R.A. Dickey of the New York Mets is still the prime trade target, with Boston in the mix for him, too. Josh Hamilton remains the top free agent amid speculation the slugger will re-sign with Texas. Ace pitcher Zack Greinke also is available, with the Los Angeles Dodgers and the Rangers very interested. Dodgers manager Don Mattingly said he's been involved in the pursuit of one free agent. He didn't disclose who it was, but seemed to be enjoying this week's developments. "It's like a smorgasbord of baseball. It's been good," Mattingly said. Boston has been the most active team this offseason, by far. A day after giving All-Star bat Mike Napoli a $39 million, three-year deal, the Red Sox lured Victorino with the exact same contract terms. "Can't wait to get to Boston!" Victorino tweeted during a day of snorkeling in Hawaii. The Red Sox are coming off their worst season since 1965 and trying to reshape the roster. The 32-year-old Victorino is a two-time All-Star and three-time Gold Glove winner who stole a career-high 39 bases for Philadelphia and the Dodgers last season. Recently, the Red Sox added Jonny Gomes and David Ross. "I think we're making the progress that we've hoped, at least in the early going, with adding those types of players," new manager John Farrell said before the Victorino deal. Victorino projects to play right field at Fenway Park  or his arrival could lead to a trade of center fielder Jacoby Ellsbury, coming off a disappointing and injury-interrupted season. The Nationals and Haren are close to completing a one-year deal for $13 million, CBSSports.com's Heyman reported. Washington had the best record in the majors last season. The NL East champions already have a formidable rotation led by Gio Gonzalez and Stephen Strasburg, and want to throw in Haren, an All-Star from 2007-09. "I've got some young guys that act like veterans, and they pitched like veterans last year for me, and a veteran like Dan Haren is just going to make things even better," Nationals manager Davey Johnson said. Haren was 12-13 with a 4.33 ERA in 30 starts for the Los Angeles Angels. They nearly traded the 32-year-old righty to the Chicago Cubs for reliever Carlos Marmol after the season, but the deal fell apart. Then the Angels declined their $15.5 million option and paid a $3.5 million buyout. "World Series or bust, that's probably the slogan this year. But I'm comfortable with that," Johnson said. The price tag on Hamilton figures to be high. The 2010 AL MVP came to Nashville this week, presumably to talk to potential new teams, though Texas could be his landing spot. "I expect we will get together relatively soon," Rangers general manager Jon Daniels said. "I keep reading that we've got a deal done. I keep asking the guys in the room who snuck out and did it?" "We left it as he was going to test the market and once he had an idea of what was out there, then we would talk," he said. "We haven't had that conversation yet." The Mets and All-Star third baseman David Wright finalized a $138 million, eight-year contract, the largest deal in team history. The sides reached agreement last week, subject to a physical, and Wright planned to talk about it Wednesday at the meetings. On Sunday, Dickey was at the Opryland Hotel to see a Mets trainer. The knuckleballer will make $5.25 million next year and would like an extension. Mets general manager Sandy Alderson briefly met this week with Dickey's agent, Bo McKinnis. "Something could happen on either front that would bring this to a conclusion, presumably," Alderson said. "I don't expect that's going to happen today. It may not happen tomorrow. It may not happen in Nashville." 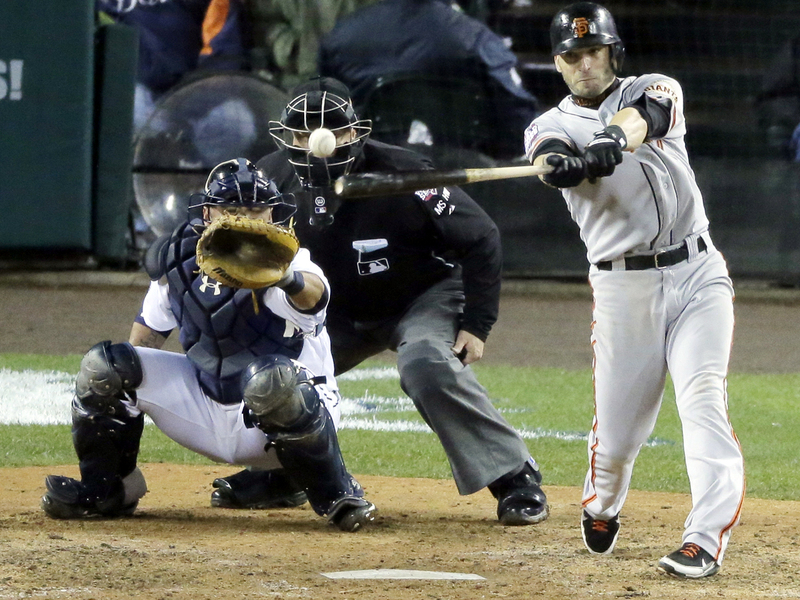 The World Series champion Giants kept Scutaro, the NLCS MVP, by giving the free-agent second baseman a $20 million, three-year contract one day after retaining center fielder Angel Pagan with a $40 million, four-year deal. Arizona reached a one-year agreement with veteran utility man Eric Hinske. Escobar's stay in Miami barely lasted two weeks. The payroll-cutting Marlins sent him and his $5 million salary across the state for minor league infielder Derek Dietrich. Escobar was acquired on Nov. 19 in a 12-player trade that sent Jose Reyes, Mark Buehrle and Josh Johnson to Toronto. Escobar batted .253 last season with nine homers and 51 RBIs. Colorado bolstered its bullpen with Lopez. The 29-year-old righty was 6-3 with 10 saves and a 2.17 ERA in 64 games for the Astros. He struck out 54 and walked only eight in 66 1-3 innings. The 24-year-old White split last season with the Rockies and Triple-A Colorado Springs. He was 2-9 with a 5.51 ERA in 23 games for the Rockies, including 20 starts. The 23-year-old Gillingham was 6-8 with a 3.66 ERA at Class-A Asheville in his first full pro season.